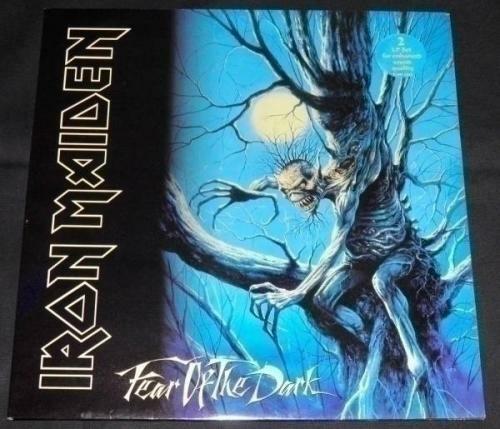 IRON MAIDEN - FEAR OF THE DARK! 1992 EMI EMD 1032 RARE 2-LP UK 1st Pr INSERT NM! ON OFFER HERE IS THIS VERY RARE GENUINE UK 2-LP FIRST PRESSING OF THE FANTASTIC BRITISH HEAVY METAL ALBUMFEAR OF THE DARKBYIRON MAIDENON THE EMI RECORDS LABEL, COMPLETE WITH STUNNING GATEFOLD PICTURE SLEEVE AND MERCHANDISE INSERT. THE SUPERBLY ILLUSTRATED, GATEFOLD PICTURE SLEEVE IS INEXCELLENTCONDITION WITH A ONE INCH AREA OF SCUFFING TO THE TOP EDGE ON THE BACK PART OF THE GATEFOLD. THIS HAS NOT SPLIT THROUGH. THERE IS ONE TINY MARK AT THE CENTRE OF THE SPINE ON THE FRONT. OTHERWISE THIS SLEEVE IS IN FANTASTIC CONDITION. THE ONLY OTHER THING I NOTICED IS EVIDENCE OF FOXING BUT ONLY INSIDE THE OPENINGS. THE ILLUSTRATED MERCHANDISE INSERT IS INVERY GOODCONDITION WITH SOME CREASING TO ONE SIDE. VISUALLY THE FOUR SIDES OF GLOSSY BLACK VINYL ALL APPEAR TO BE INNEAR MINTCONDITION AND UNDER BRIGHT LIGHT I CAN ONLY SEE A FEW TINY HAIRLINE MARKS. I HAVE CAREFULLY LISTENED TO ALL FOUR SIDES OF THIS GREAT ALBUM AND I CAN CONFIRM THAT THE SOUND QUALITY IS SUPERB THROUGHOUT. THE STUNNING ILLUSTRATED LABELS ARE ALL INNEAR MINTCONDITION. ALL RECORDS ARE REMOVED FROM ANY PICTURE SLEEVE TO PREVENT KNIFING. I DO NOT USE'ENVELOPE STYLE'MAILERS. INSTEAD I USE SPECIAL MAILERS DESIGNED TO PROTECT YOUR RECORDS AND ENSURE SAFE ARRIVAL. I HAVE DESCRIBED THIS RECORD STRICTLY ACCORDING TO RECORD COLLECTOR MAGAZINE GRADING SYSTEMS SO THERE WILL BE NO NASTY SURPRISES FOR THE WINNING BIDDER. THIS RECORD HAS BEEN CAREFULLY VISUALLY & FULLY PLAY-GRADED. I AM HAPPY TO COMBINE PURCHASES BUT PLEASE DO NOT PAY UNTIL YOU HAVE FINISHED BIDDING!! PAYMENT FOR COMBINED PURCHASES MUST BE MADE ON FINAL COMBINED INVOICE! PLEASE LET ME KNOW YOUR INTENTIONS! POSTAGE DETAILS - PLEASE READ!! THE POSTAGE DETAILS AREPRE-FILLEDTO INCLUDE TRACKING & INSURANCE. IF NECESSARY I WILL AMEND INVOICES WITH THE CORRECT POSTAGE CHARGE AT THE END OF THE AUCTION. PLEASEWAITFOR AN INVOICE BEFORE YOU PAY!! PROOF OF SHIPPING IS RETAINED FOR ALL POSTINGS AND I WILL PROVIDE TRACKING NUMBERS, WHERE APPLICABLE. I WILL ACCEPT BIDDERS FROM ANYWHERE IN THE WORLD. I WILL ACCEPT PAYPAL, CHEQUES AND POSTAL ORDERS FROM UK BIDDERS. FROM OVERSEAS BIDDERS I CAN ONLY ACCEPT PAYMENT VIA PAYPAL IN £GBP STERLING. IF PAYMENT IS NOT RECEIVED WITHIN A FEW DAYS I WILL ISSUE A NON-PAYING BIDDER ALERT AND IF PAYMENT IS NOT RECEIVED I WILL RE-LIST THE ITEM. MINT (M)THE RECORD ITSELF IS IN BRAND NEW CONDITION WITH NO SURFACE MARKS OR DETERIORATION IN SOUND QUALITY. THE COVER AND ANY EXTRA ITEMS SUCH AS THE LYRIC SHEET, BOOKLET OR POSTER ARE IN PERFECT CONDITION. RECORDS ADVERTISED AS SEALED OR UNPLAYED SHOULD BE MINT. EXCELLENT (EX)THE RECORD SHOWS SOME SIGNS OF HAVING BEEN PLAYED, BUT THERE IS VERY LITTLE LESSENING IN SOUND QUALITY. THE COVER AND PACKAGING MIGHT HAVE SLIGHT WEAR AND/OR CREASING. VERY GOOD (VG)THE RECORD HAS OBVIOUSLY BEEN PLAYED MANY TIMES, BUT DISPLAYS NO MAJOR DETERIORATION IN SOUND QUALITY, DESPITE NOTICEABLE SURFACE MARKS AND THE OCCASIONAL LIGHT SCRATCH. NORMAL WEAR AND TEAR ON THE COVER OR EXTRA ITEMS, WITHOUT ANY MAJOR DEFECTS, IS ACCEPTABLE. GOOD (G)THE RECORD HAS BEEN PLAYED SO MUCH THAT THE SOUND QUALITY HAS NOTICEABLY DETERIORATED, PERHAPS WITH SOME DISTORTION AND MILD SCRATCHES. THE COVER AND CONTENTS SUFFER FROM FOLDING, SCUFFING OF EDGES, SPINE SPLITS, DISCOLOURATION, ETC. THE USE OF PLUS (+) OR MINUS (-) ALLOWS FOR ITEMS THAT FALL BETWEEN THE ABOVE GRADES.